Synonyms: Nilgirianthus wightianus (Nees) Bremek. 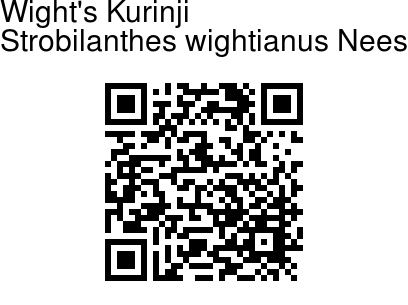 Wight's Kurinji is a shrubs with branches hairy. Leaves are 7 x 4 cm, ovate, tapering, sawtoothed, densely hairy; nerves 4 pairs; leaf-stalk 2-3 cm long. Flowers are borne in obconical spikes 1.5 x 2.5 cm; flower-cluster-stalk 2-6 cm long; involucral bracts 2-4, leafy, 1-3 x 1.5 cm; floral bracts densely hairy at base; bracteoles linear. Flowers are few; sepals 1 cm long, hairy, united below the middle; flower 2 cm long, pale blue, tube 5 mm long, hairy inside. Capsule is 9 x 3 mm, hairless; seeds 3 x 3 mm, round, hairless, oblique at base. 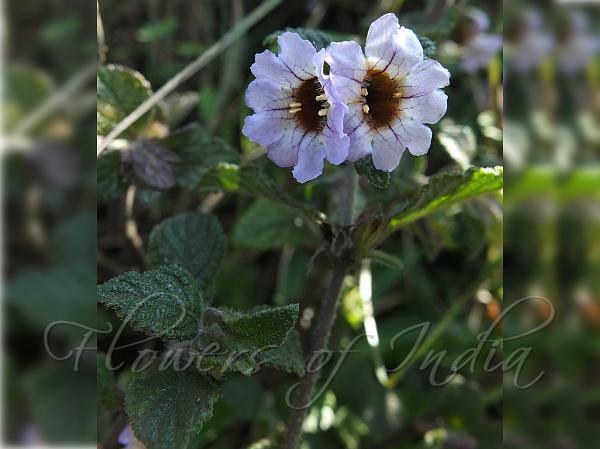 Wight's Kurinji is endemic to Southern Western Ghats.